You guys! It is only blimmin’ Christmas! And quite importantly, I only have one more module of Physics and an exam to get through, and then I am freeeeeeee! Until going back to school (hopefully) in the Summer. Anyhow, while work commitments, distance, and a general lack of organisation have prevented me from writing Christmas cards, I did finally get round to using up my glorious Christmas fabric to make myself an outfit. I know. Bom-chicka-wah-wah! 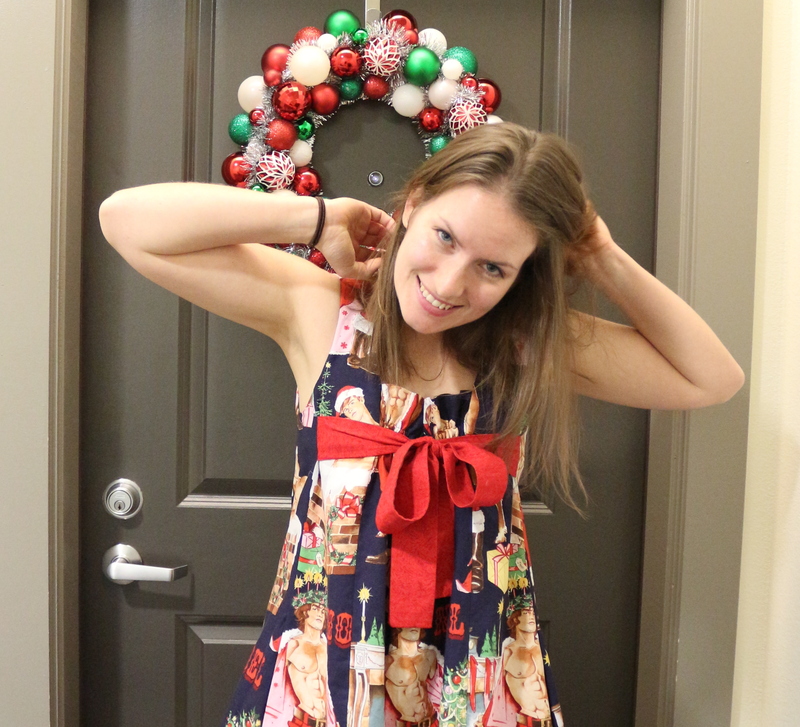 And of course the reason why I call this my borderline inappropriate Christmas dress, if a dude can get in trouble for wearing a shirt with scantily clad ladies on it while being interviewed for landing something on a comet, then it would be terribly double standards of me to wear this out in public……… I am pretty sure I will anyway. I bought mine from Stonemountain and Daughter Fabrics in Berkeley, after either a fabric swap or a pattern swap with the Bay Area Sewists. 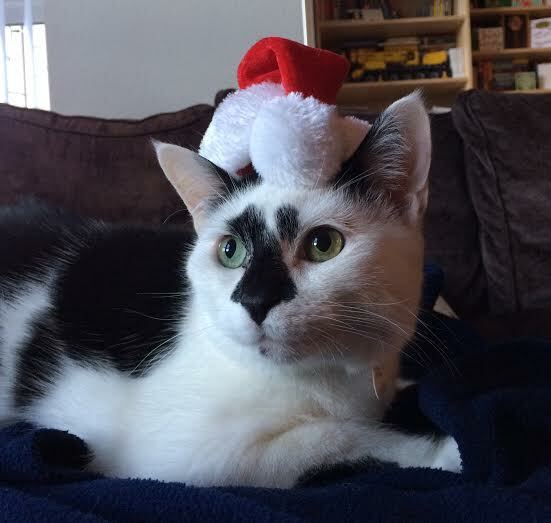 I was conflicted over what to make, which pattern etc. 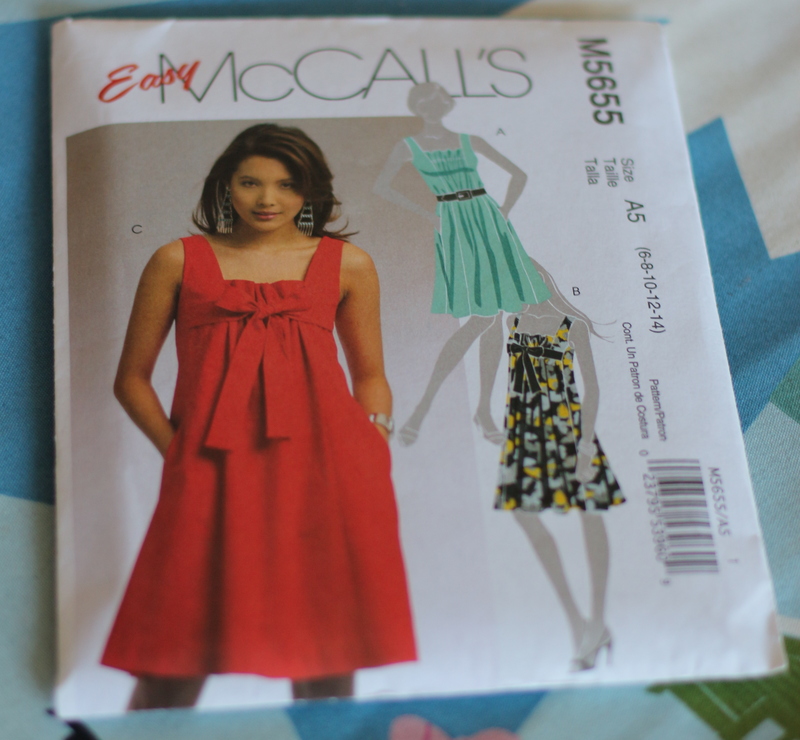 but then found Easy McCall’s M5655 in my stash, which I picked up at a pattern swap. She doesn’t look all too impressed with it, but it is really easy to put together, minimal fitting (the only modification I made was to add an inch at the shoulders), and has POCKETS! I love pockets. Or rather, I hate outfits without pockets, which is kind of the same thing. It is kinda not my style, much like ALL dresses, but for this outfit I think it works really well. 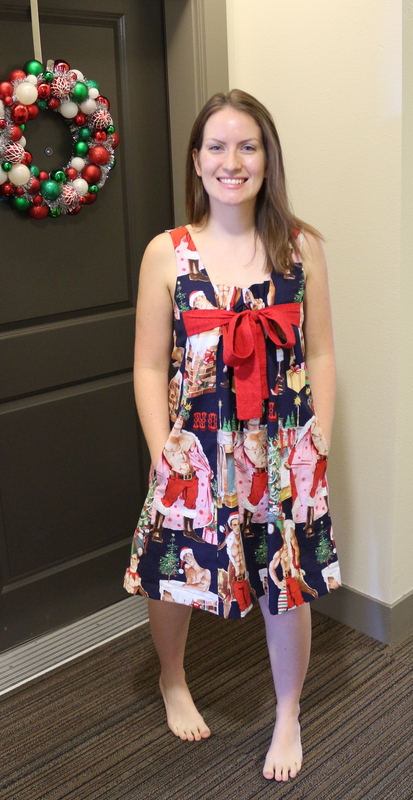 My poor Bernie is unfortunately sick and requires a trip to the sewing machine doctor, so this entire dress had to come together using my $60-weighs-about-the-same-as-a-bag-of-flour-pretty-much-entirely-made-out-of-plastic portable sewing machine. Further evidence of how easy it was to put together, as that thing is not particularly robust! Haha! Ha ha, how marvelous that you made a dress from this fabric, and even more incredible that you managed to make a dress that looks stylish too (well, at first glance anyway, until you notice the fabric design). Hahah! Moi? Stylish? Non! Never!